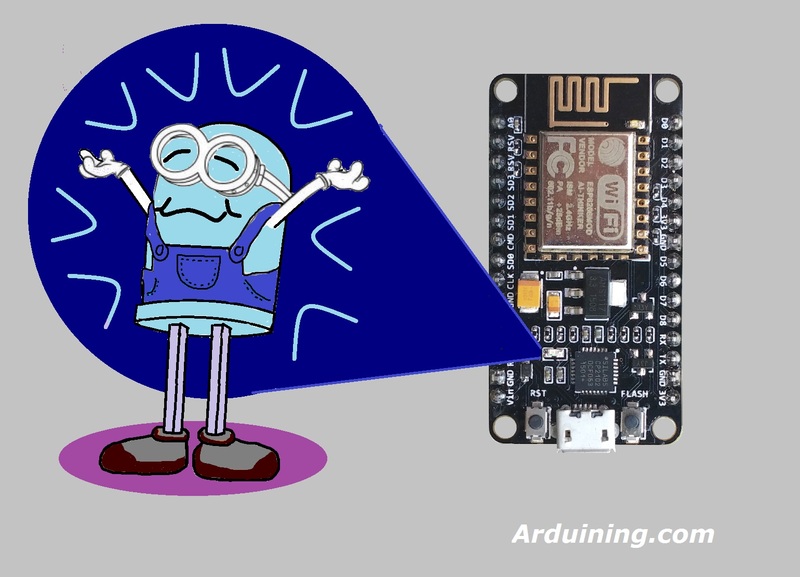 The first sketch used to test an Arduino compatible board is Blink. -Mini servers to control leds, servos, etc..
-Send light intensity and temperature to ThingSpeak, Xively, Plotly etc.. The blue led in the board was used to signal the execution of a particular procedure. Inspired by the Apple’s “breathing” pattern used for the sleep indicator. Here is the code to generate a “breathing LED”. The Arduino code runs inside a multitasking application, the ESP8266 is running at the same time TCP and WiFi stacks. The sketch can breake the multitasking execution if your code runs in a blocking section. The delayMicroseconds() is one of those blocking functions, delay(0) was used to prevent watchdog reset inside the PWM loops. Going beyond Blink sketch to see the blue LED breathing. #define LED     D0        // Led in NodeMCU at pin GPIO16 (D0). #define INHALE    1250    //Inhalation time in milliseconds. pinMode(LED, OUTPUT);   // LED pin as output. digitalWrite(LED, LOW);          // turn the LED on. digitalWrite(LED, HIGH);         // turn the LED off. delay(0);                        //to prevent watchdog firing. Next Next post: Arduino For Free, Almost. I’m confused as this code does not compile in the Arduino ide. ‘D0’ was not declared in this scope. Am i doing something wrong? I tried the 16 thing and while it compiled, nothing is flashing. Can we use AnalogWrite() to generate PWM on NodeMCU pins???? digitalWrite(LED, LOW); // turn the LED on. I am so close to trashing this unit as it is nearly impossible to work with. I got this to work now. I found a site that had the pin constants defined. Are you going to tell us what the correct pin mapping is? The specific lines are below ardunaut’s reply. The “ok” are the connections I used to my 4 channel relay. Does anyone know if this NODEMCU/Arudino IDE combo is based on the NoOS SDK or the RTS SDK? I couldn’t get anything to work with a network using the Arduino setup and I developed at the SDK level (RTOS). I got things working but I am having issues figuring out how to do GPIO on the RTOS SDK so I am thinking of porting my Ethernet working code over to Arduino. I really need to know, is there a way to do this with micropython??? What exactly represents BRIGHT? At first look it should represents the led luminosity. But going deeper it represents only the number of step to reach the maximum luminosity. Changing BRIGHT to 500 causes crash.